Ah, Modern Warfare 2. The epitome of all that is unfair. Take a perfectly good formula, gimp it, insult the consumers...and then sit back and laugh as you sell 4.7 million copies in one day. Watch Call of Duty 4: Modern Warfare crash the PlayStation Network in 2007, and then act surprised when it happens again in 2009. Tout your campaign as being so important that it can't support the interference of multiplayer co-op players, then copy/paste the same missions to a side mode called Special Ops...and furthermore encourage players to skip an integral plot point via the most controversial playable scene this year. Okay, you get the point. Too many great minds in one place seems to have caused quite the tangle at Infinity Ward, but at least the gameplay remains intact. Our review is coming next week, so I'll save the rest of the soap box speech until then. In the meantime, tell us what you think of Special Ops. Do you like the mission variety? Is it smooth online? And more importantly: are you ready for Spec Ops DLC? According to Infinity Ward, future extra co-op missions are a distinct possibility. What do you think? SANTA MONICA, Calif., Nov 12, 2009 /PRNewswire-FirstCall via COMTEX News Network/ — Activision Publishing, Inc. (Nasdaq: ATVI) announced today that Infinity Ward’s much-anticipated Call of Duty(R):Modern Warfare(R) 2 has become the biggest launch in history across all forms of entertainment with estimated sell-through sales of $310 million in North America and the United Kingdom alone in the first 24 hours, according to internal Activision estimates. Modern Warfare 2 was released on Tuesday, November 10th, to worldwide fanfare across the globe, including over 10,000 retail outlets in the U.S. alone which held midnight openings to meet consumer demand. In its first day, the blockbuster title sold through approximately 4.7 million copies in just North America and the United Kingdom, according to internal Activision estimates. Modern Warfare 2 picks up following the historic events of Call of Duty(R) 4: Modern Warfare(R), the blockbuster title that remains the top selling first person action game in history. Modern Warfare 2 is rated “M” (Mature) by the ESRB for Blood, Drug Reference, Intense Violence and Language. 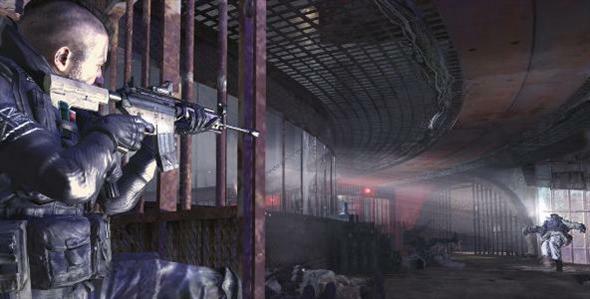 For additional information about the game, visit www.modernwarfare2.com.